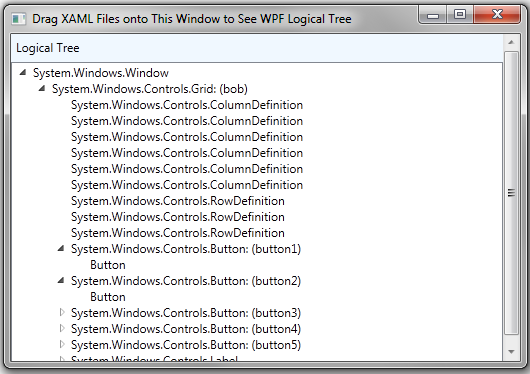 Here’s a little WPF application that can load .xaml files and then display the underlying logical tree. It uses the LogicalTreeHelper.GetChildren method to recursively descend through the logical tree and display it in a TreeView control. You can find full source code at the WPFLogicalTree project on Codeplex. Ok, .zip file now available on Codeplex. Was temporarily not accessible, but working now.